The Skelton Family of North Street. During 1823, blacksmith William Skelton, with his wife and children, moved from St Pinnock to North Street Lostwithiel. The family lived at number 28, with their Smithy and Forge at the rear. During the 19th C and early 20th C, the lower end of North Street was sometimes known as ‘Bridge Street’, but by 1911 it had reverted to ‘North Street’, as it is today. William was very skilled, and started making his own agricultural implements. He invented the Single Furrow Turn-Wrest Plough, better known as the Butterfly Plough, which he patented. When it was displayed in an exhibition at Crystal Palace, London, in the 1880s it was awarded a gold medal. William patented other agricultural and non-agricultural tools and implements up to the 1890s. The most visible evidence of the Skelton’s artistry and skills in Lostwithiel is the Cockerel Weather Vane on top of St Bartholomew’s Church spire, which the family made for the Church when it was refurbished in 1878. 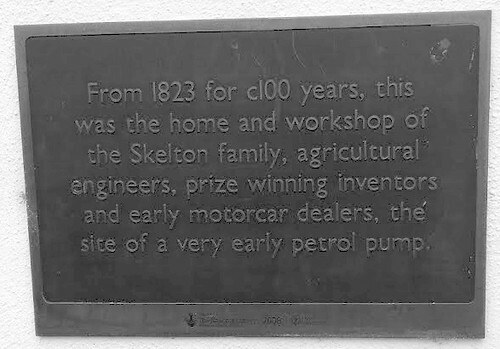 After William Skelton’s death, his son Joseph continued in the family business, and along with his own son, also William, the talented family moved with the times. They made their own Penny Farthing bicycles, and pioneered the Safety Bicycle, making their own chains link by link. Their business developed into a Garage, selling and repairing cars; in 1911-12 they became sole agents in the area for Ford cars, including the Model T 'Tin Lizzie'. 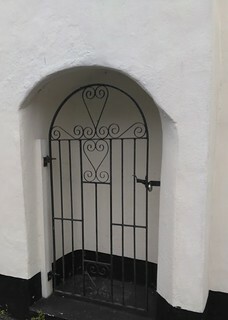 The recess on the side of 28 North Street is where the petrol pump was installed, with cars stopping at the kerbside to refuel. The Garage business expanded to take in both 28 and 29 North Street, and to Grenville Road, with a Garage just over the railway crossing on the left hand side, now long since demolished. 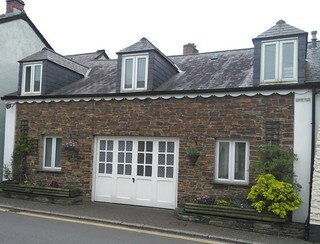 The Car Showroom was opposite the Garage premises in North Street - it is now a private dwelling. Eventually family members moved away, and by 1936 the Skelton name had died out in the town. The Garage business in North Street continued under various owners, and many local men were given mechanical apprenticeships over the decades, but it finally closed down in 1991. The garage was dismantled and the site became private houses. Words - Gillian Parsons Published in Lostwithiel Newsletter May 2018 as part of the My Lostwithiel series.